Place the pumpkin on a baking dish, sprinkle with 2 tablespoons of olive oil and season with salt and black pepper to taste. Bake for 35-40 minutes or until the pumpkin is soft and lightly browned. Remove from the oven and set aside. Mix the arugula, onion, khorasan and avocado in a bowl. Place the pumpkin slices on top. Sprinkle with 2 tablespoons of olive oil, balsamic glaze and goat cheese. To cook the khorasan wheat: soak the wheat in water over night. Strain and cook in 3 cups of water for 2 hours or until tender. Strain and store refrigerated in a sealed container. You can add to salads, soup or eat in place of rice. If you don’t like goat cheese, use queso fresco or feta instead. If you don’t have balsamic glaze, use balsamic vinegar. If you’re looking for delicious ways to enjoy pumpkin this season, don’t look any further! 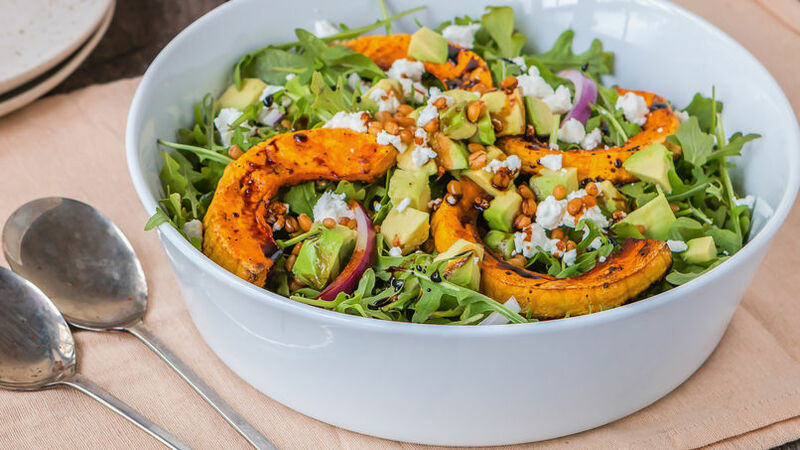 This roasted pumpkin salad and khorasan wheat is truly a delicious treat that will leave you wanting more. If you’re not familiar with khorasan wheat, you can also use spelt or any other type of wheat. Most wheat grains require soaking time and long cooking times, so what I do is prepare 1 or 2 cups at a time and keep it refrigerated to use during the week. I promise, the extra work is worth it because these grains add tons of texture, flavor and nutritional benefits to your food. Enjoy!